How do bodies cause minds? How do minds affect bodies? Can there be minds without bodies? Can there be bodies -- that is, behaving bodies -- without minds -- that is, without consciousness? Reflexes, both spinal and cranial, are involuntary responses to stimulation that involve only a single muscle (or group of muscles). ; A classic example is the patellar reflex that occurs when a physician's hammer strikes the patellar tendon in the knee. ;Taxes, commonly observed in invertebrates, which involve the orientation and movement toward or away from a stimulus. ; An example is the positive phototaxis observed in moths who are attracted toward a source of light. Instincts, or fixed action patterns, more complex, species-specific patterns of behavior, shaped by evolution, that occur in response to very specific stimuli. ; Familiar examples include imprinting in geese and the zig-zag dance of the stickleback fish. None of these innate stimulus-response patterns involves any mental activity on the part of the organism. ; Spinal reflexes persist in quadriplegic patients; insects hardly have brains at all; and ducklings don't "want" to follow -- they just do it automatically. In classical conditioning, the association between the conditioned stimulus (Pavlov's bell, for example), and the conditioned response (the dog's salivation) is reinforced by the presentation of the unconditioned stimulus (and subsequent reflexive salivation). In instrumental conditioning, the association between the conditioned stimulus (Thorndike's puzzle box or Skinner's operant chamber) and the conditioned response (paddle-pressing or key-pecking) is reinforced by escape or a pellet of food. Of course, we now know that classical and instrumental conditioning are more complex, and more interesting than that -- to begin with, they seem to be mediated by expectations of prediction and control. ; But the fact that some effects of classical and instrumental conditioning can be demonstrated in very simple organisms -- like aplysia -- suggests that, for these organisms at least, conditioning doesn't involve any great deal of "higher" mental activity. But a course like this doesn't care much about that. ; It begins, frankly, where Descartes began -- with the phenomenal experience of conscious awareness. ; Descartes thought that nonhuman animals were reflex machines, lacking in consciousness, and thus lacking in free will. ; Humans, being animals as well, also operated by virtue of reflex, sometimes; but by virtue of consciousness, he argued that we also had a power of free will that liberated us from reliance on reflex, and enabled us to engage in voluntary as well as involuntary behavior -- and which gives us the possibility of sin (remember that Descartes was a faithful son of the Catholic Church).In trying to understand the nature of human consciousness, it turns out that we can make a fair amount of progress without getting overly caught up in the mind body problem -- at least as it's been traditionally formulated. ; Rather than getting trapped at the Cartesian impasse, it seems more appropriate, as Searle (1992) argued, to break out of (or, perhaps, away from) received categories like body and mind, dualism and monism, and simply figure out what the mind does -- that is, what human consciousness is, the nature of altered states of consciousness, and the role that both conscious and unconscious mental life plays in human experience, thought, and action. Chalmers (1996) resurrected the zombie argument against materialism, earlier proposed by Campbell (1970) and Kirk (1974). ; The argument begins with a definition of zombies as creatures that are physiologically identical to humans, but lack conscious experiences. Whatever is conceivable is possible. And if zombies are possible, then materialism leaves something out. There's something about consciousness that is not accounted for by the anatomy and physiology of the nervous system. The zombie argument, as stated, is logically correct, in that the conclusion (3) follows from the major (1) and minor (2) premises. ; If the premises are valid, then the conclusion is valid..
More important, as Dennett has pointed out, the argument is simply incoherent. ; If the brain is the physical substrate of the mind, then a being that is physiologically identical to humans would perforce have consciousness. ; Dennett has playfully suggested that we consider yet another kind of creature, a zimbo, which is a zombie that believes it is conscious (and frankly, sometimes, that's what Dennett seems to think we really are). And I have a similar problem: if we are interested in the role that consciousness plays in behavior, we can't begin by assuming the existence of a creature that is behaviorally identical to humans but lacks consciousness. ; That's because the whole point of the zombie argument is to determine whether consciousness makes any difference to behavior. ; If consciousness is epiphenomenal, the way T.H. Huxley said it was, then consciousness makes no difference to behavior. The philosophical zombie is a creature that is physiologically and behaviorally identical to humans, but lack conscious experience. The Haitian zombie, derived from voodoo lore, was once a normal human, but now lacks a soul, and thus free will. "Keep an eye on the date each story was published, and you can track how zombies change from brainless workers to brain-eating ghouls"
"[T]he watershed year for zombies was 1968, and the theatrical release of George Romero's "Night of the Living Dead". ; All the rules of the modern zombie were codified in that movie. ; Zombies hunger for living flesh; they are impervious to all attacks short of destroying the brain or incineration; anyone who dies during the zombie apocalypse is shortly reanimated into a zombie". Night of the Living Dead (1968), now listed in the National Film Registry of the Library of Congress. Birth of the Living Dead (2014) isn't a prequel; it's a documentary, by Rob Kuhns, of the making of Night of the Living Dead. Actually, though, zombie movies have a history going much further back into the history of cinema. including I Walked with a Zombie (1943). ; Romero's movies are especially interesting because his zombies evolve from movie to movie, and eventually seem to attain something like consciousness -- at which point, of course, they shouldn't really be called zombies anymore. Romero's zombies are interesting because they evolve. ; In Night of the Living Dead, the zombies are classic Hollywood zombies -- creatures without consciousness. ; But in Survival of the Dead there is a suggestion that zombies can be domesticated, kind of like household servants. ; Or, perhaps, robots. Let us now praise famous zombies. ; In the beginning, there weren't any, since the ravenous corpses in George A. Romero's epoch-making Night of the Living Dead (or, if you prefer, Night When the Dead Brought the War Back Home to a Racially Torn America) were an undifferentiated lot, utterly lacking in emotion, social organization or habits, let alone individuality. ; But this situation began to change with the sequel, Shopping Mall of the Dead, in which the zombies turned out to retain a primitive set of consumerist reflexes. ; B the time Romero got to Luxury Mixed-Use Development of the Dead, one of the zombies (played by Eugene Clark) had developed enough foresight and leadership ability that he could be identified by name: big Daddy. ; and now, in feuding Stage-Irish Folkways of the Dead (official title: Survival of the Dead), Romero has given us his first zombie romantic lead in the lovely O'Flynn lass (Kathleen Munroe), who remains a dashing equestrienne even after her eyes turn a uniform milky blue. See also 28 Days Later and 28 Weeks Later, which the San Francisco Chronicle called "the scariest zombie enterprise since George ('Night of the Living Dead') Romero loomed over the landscape". World War Z: An Oral History of the Zombie War (2006). ;Steven Schlotzman, a physician who teaches at Harvard Medical School, wrote a novel, The Zombie Autopsies: Secret Notebooks from the Apocalypse (2011), which purports to be based in part on a secret paper from the Centers for Disease Control on Ataxic Neurodegenerative Satiety Deficiency (ANSD) Syndrome. ; He subsequently appeared as a guest on Coast to Coast AM, a late-night radio talk show, to promote his book. ; Much as Orson Welles had done the night before Halloween 1938, with his radio dramatization of H.G. Wells's the War of the Worlds, Punnett played the straight man, and the interview proceeded as if such a report, and such a syndrome actually existed. ; The result, as with Welles's radio play, was, if not wholesale panic, a small avalanche of emails from people who thought that the interview had been in earnest, and there really was an epidemic of ANSD. ; Schlozman tells the story, and explores its implications for pop-culture and the transmission of rumors, in "The Harvard Doctor Who accidentally Unleashed a Zombie Invasion", New York Times Magazine, 10/27/2013. Moving from fiction to nonfiction, Tim Verstynen and Bradley Voytek have written Do Zombies Dream of Undead Sheep? (the title a play on a short story by Harlan Ellison which was the basis for the movie Blade Runner) which actually tries to connect zombie myth with modern neuroscience. And, so help me, there is actually a Zombie Research Society. Link to the "Zombies on the Web" page compiled by David Chalmers. The problem with the philosophical zombie is that the definition misses the point. ; Dennett's right: a creature that was physiologically identical to humans would have consciousness, because the brain is the physical basis of mind. Let's first define a zombie as an organism that has lots of information-processing and behavioral powers, but simply lacks consciousness. ; That's what a Hollywood zombie is. ; That's what a Haitian zombie is. ; Zombies are, essentially reflex machines, who lack consciousness. And then let's ask the really interesting question about zombies: are there any information-processing or behavioral functions that zombies cannot perform, precisely because they lack consciousness? Can a zombie lose its Palm Pilot? and which an organism could not perform if it were not conscious? If there are such functions, then to that extent consciousness is not epiphenomenal. Consciousness plays a causal role in the material world composed entirely of physical particles in fields of force. The question is important, because it turns out that there are many psychologists who believe that, in our everyday social behavior, we are little more than conscious zombies -- we have consciousness, but we don't use it very often, and it often gets in the way. I call this trend in psychological theory The Automaticity Juggernaut, and to understand it we have to take up the problem of attention and consciousness. Here's some background. 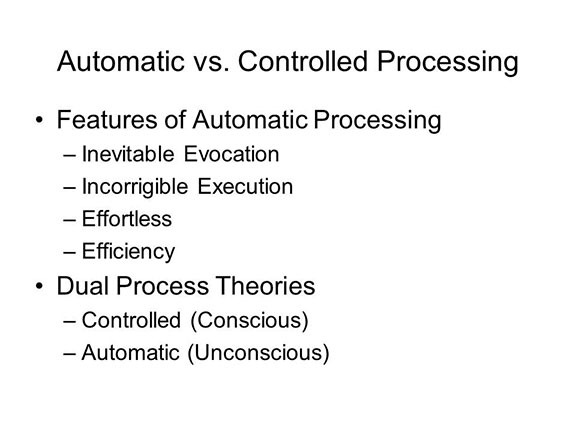 Since the mid-1970s, cognitive psychology has bade a distinction between automatic and controlled processing. To make a longer story short, automatic processes are unconscious, while controlled processes are conscious. A collection of dual-process theories assumes that performance on any task reflects a combination of automatic and controlled processes; or, alternatively, that such tasks can mediated by either automatic or controlled processes. Social psychologists began to embrace the automatic-controlled distinction in the 1980s, but with a twist. While nominally offering dual-process theories of task performance, many social psychologists have proffered the view that experience, thought, and action are almost entirely controlled by automatic, unconscious processes. 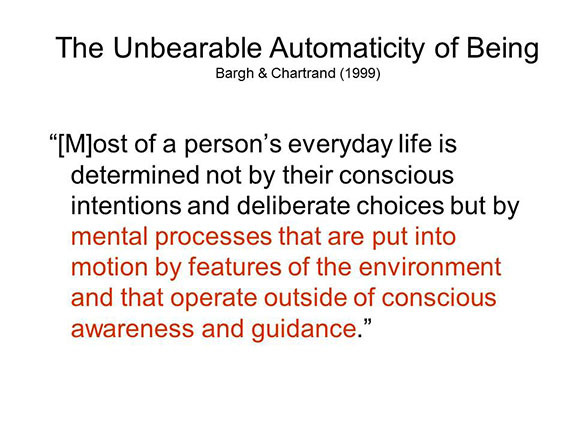 This renders conscious, controlled processing redundant at the very least, irrelevant or positively harmful at most. This is a version of conscious inessentialism, or even epiphenomenalism -- a claim that, despite our experience of consciousness, deep down we are really automatons after all. This page last revised 09/07/2016.